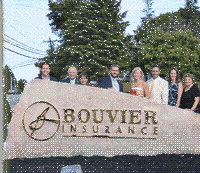 ouvier Insurance, formerly Bouvier Beckwith & Lennox, Inc. was established by Robert F. Bouvier in 1959 and has grown into a full service insurance group handling all types of insurance with six locations throughout Connecticut. Recently we opened our seventh location in Westerly, Rhode Island. Our agency was built on small town values of honesty and integrity. Throughout the years we have consistently provided our clients with superior customer service coupled with state of the art insurance products and services. We are proud to say that we have stayed true to our values and are committed to the clients communities we serve.